Utility rates are among the lowest in the nation. Whether electric or natural gas, our utility partners support and make it easy to do business in Elkhart County, Indiana. Negotiated Sales Service, Energy Access Online, Engineering & Construction services with Power Quality Analysis are all tailored to suit customer’s specific gas requirements and company profile. I&M provides reliable, high-quality electricity with economic development incentives available for new and expanding commercial/industrial customers. I&M’s balanced energy portfolio is currently more than 50% emission-free with renewable energy sources coming from solar, wind, and hydro-electric dams. 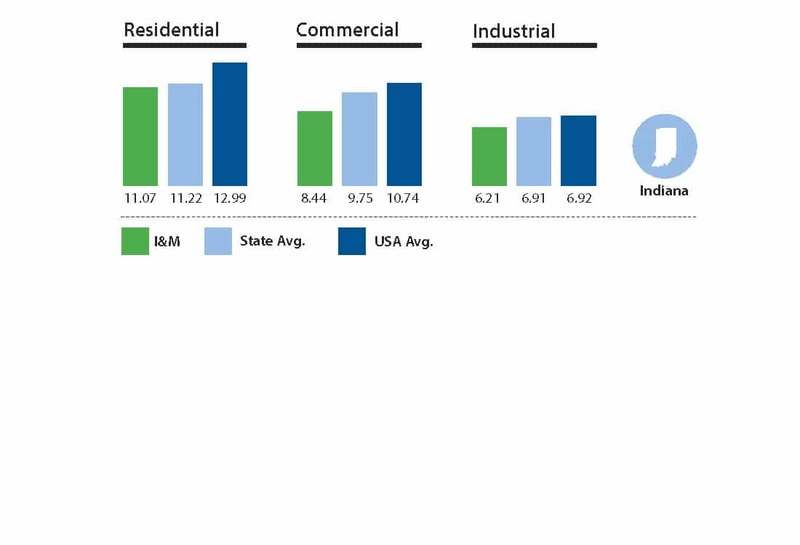 NIPSCO electric rates are, on average, below the national average. Electric rates are better with a higher load factor. Given the same load factor, the rates are better the more electricity you use. For small usage, the current cost per kwh is 10.0 to 10.8 cents. For higher usage, the current cost per kwh is 6.8-9.8 cents. NIPSCO gas rates and gas transportation rates are among the lowest in the nation. The gas rates are generally lower the more usage there is. For small usage, the current range is 70-90 cents per therm. For large usage, the current range is 65-70 cents per therm. These estimates are based on the current (February 2011) billing determinants. As determinants change, these gas rates could vary by up to 1 cent per therm. Negotiated Sales Service – Unique sales tariff available to gas customers averaging 200 Dth/day. Transportation service and pricing bundled into one sales price. Contracts individually negotiated and tailored to specific gas requirements and profile. Energy Access Online – Gas transportation customers access information and submit nominations. Online data includes BTU values, daily pricing, daily metered usage and contract summaries. Transactions support: imbalance exchange and balance nominations. Construction Services – Over 70 years of experience in electric line construction, sub-station maintenance, distribution transformer maintenance, thermography, gas pipeline construction, directional boring, trenching and corrosion control. Engineering – Design for electrical substations, transmission and distribution lines. Field services for commissioning of new equipment, troubleshooting and repair of existing equipment. Power Quality Analysis – Identify power disturbance problems and provide optimal solutions. Business Link – Service representatives team available 24 hours a day to NIPSCO industrial customers.